In 2014, TeaVivre visited the famous organic tea garden in Fujian province and took some pictures with which we want to show you some brief information of organic tea. According to the USDA National Organic Standards Board (NOSB), organic agriculture is defined as “an ecological production management system that promotes and enhances biodiversity, biological cycles, and soil biological activity”. The primary goal of organic agriculture is to optimize the health and productivity of interdependent communities of soil life, plants, animals and people. Aiming to balance the economic development and ecology protection, organic tea garden emphasizes the economic benefits and sustainable development. Organic tea is the tea that has been produced without the use of synthetic fertilizers, pesticides, chemical additives or other man-made chemicals from tea garden to package. 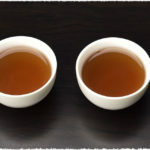 Tea can be organically produced without being certified, but in order for companies to legally sell tea international market under the organic label, it must be certified by certification organizations. Requirements for certification specify that the land used to produce the tea has been free of synthetic chemical usage for certain years, and that organic and non-organic tea is kept strictly separate during processing. Detailed record keeping and periodic inspections are required in order to ensure that the requirements are being met. 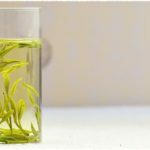 On the Chinese tea market, teas are graded into 4 levels; from high to low they are organic tea, green-food tea, pollution-free tea, regular tea. 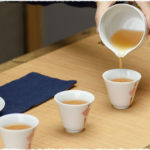 Teas labeled as organic must be certified by the authority to get the certifications and can be regarded as the representative of high-quality tea. The two main obvious benefits of organic teas are minimizing health risks by avoiding toxic chemicals in the tea and protecting the environment. So, what organic tea garden looks like? Last week, TeaVivre paid a visit to a famous organic tea garden located in Fujian Province, China and took some pictures for share. The founder of this tea garden said to us that the place used to be a natural secondary forest when he first came to this land a few years ago. Different form others, this land makes us deeply impressed by its good environmental conditions, far from factories, motorways, fields, buildings, and all those prepare ideal conditions for organic tea cultivation. Surrounded by cloud-veiled mountains and located at mountains of 500 – 800 m above sea level, this tea garden has an annual average temperature 16 – 20℃ and more than 300 frost-free days every year. Massive use of synthetic fertilizers in commercial agriculture results in nutrient pollution in water, particularly nitrogen, which damages aquatic ecosystems and can harm the fishing industry in areas downstream. The use of organic fertilizer in organic agriculture greatly reduces the runoff of nitrogen and the damage caused by such nutrient pollution. Bags of animal dung are collected from the Inner Mongolia Grassland thousands of miles away. Using animal dung as natural fertilizer in organic tea garden is an efficient way to protect environmental and accelerates tea growth. By the help of the advanced irrigation system, surface water and the water from the mountain spring can be gathered to guarantee tea quality. Avoid using any herbicide, all weeds grown in this garden are uprooted by worker’s hands and further turn them into fertilizer for cyclic utilization. Spread the withered grass around the tea tree roots with the aim of killing those tender grasses by keeping them out of sunlight. Meanwhile, those withered grass can finally be turn into organic fertilizer helping tea plants growth and having functions of minimizing the evaporation of the moisture from the ground. The inner ecological environment is very important, even when toxic chemicals do not make it into the food supply, exposure to these chemicals can pose health risks both for the workers applying the chemicals, and for people living in areas that become contaminated by the chemicals. In this organic tea garden, animals living in such as birds, fogs, ladybug, and spiders can effectively kill insects. Besides, monoculture plantation is vulnerable to attack by pests as they lack the biological diversity. So mixed tea plantation and other tree species such dalbergia odorifera tree and Eaglewood, which can both release strong odor repelling insect away, is a good ways to deal with insects and overshadow the small tree plants in hot summer. In addition to those passive defense measures, solar insecticidal lamp and Yellow sticky trap are two important devices to kill harmful insects. A Complete and Orderly Ecological Chain in Organic Tea Garden.